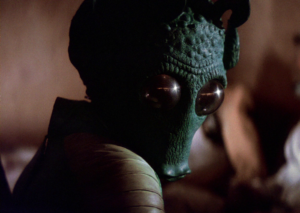 The arrival on the pop culture landscape of Star Wars was like a neutron bomb going off. Within seemingly no time at all, references were springing up across the entertainment world. 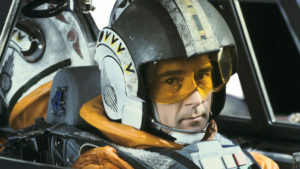 Guest spots featuring Star Wars actors and characters became commonplace and the iconography of was secured. Not since Star Trek had a sci-fi show inveigled its way into the public consciousness. Along with the characters of the films came a compelling and charismatic group of actors. To American audiences the core trio – Harrison Ford, Mark Hamill and Carrie Fisher – were known, if not widely, to movie and TV audiences. Hamill had a small role in the US daily Soap General Hospital while Ford had been building a career in film and TV since the mid 60’s and had already appeared in small roles in the mega hit American Graffitti for Lucas and The Conversation for Francis Ford Coppola. Carrie Fisher was known for an entirely different reason. Born on 21st October 1956 in Burbank, California – just a few miles north of Hollywood – Fisher came into the world as Hollywood royalty. 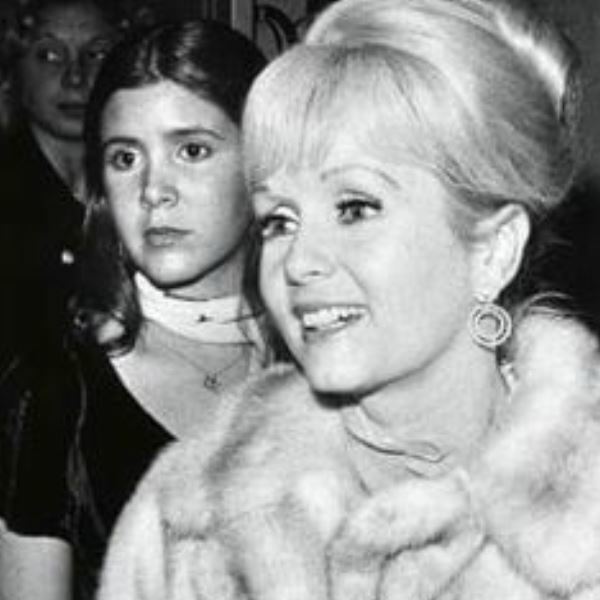 The daughter of acclaimed entertainer Debbie Reynolds and singer/actor Eddie Fisher, Carrie and her brother Todd were thrust into the limelight as one of the first celebrity babies. That only intensified after the revelation of her father’s improprieties when Eddie left Debbie to marry Elizabeth Taylor. Think the Pitt/Jolie/Anniston triangle dialled up to 11. While Hamill and Ford were able to quietly build a body of work that eventually brought them to George Lucas’ door, Fisher came with a certain ‘baggage’, and had to prove herself in a different way. Known as a bookworm to family and friends, Fisher attended Beverly Hills High School until she was 15 and appeared for the first time on the Broadway stage in 1973 as a singer in the revival of Irene, starring her mother Debbie. Later that year Fisher, not yet 18 years old, enrolled in the Central School of Speech and Drama (now part of the University of London) and attended for 18 months, honing her skills in the same school where Laurence Olivier, Vanessa Redgrave, Judi Dench and Harold Pinter honed theirs. Interestingly, future Star Wars star Riz Ahmed also attended, as did Fishers great friend chat show host Graham Norton. A film career beckoned. She made her debut in 1975’s Shampoo, directed by Hal Ashby and written by Robert Towne. Starring alongside Warren Beatty, Julie Christie and Goldie Hawn, Lee Grant and Jack Warden. Fisher played the confident young Lorna Karpf and while a brief role, the film garnered 4 Oscar nominations, winning one in the form of Best Supporting Actress for Fishers onscreen Mom Lee Grant. While only costing $4 million, the film took $50 and ended the year as the 4th biggest hit of 1975 behind Jaws, One Flew Over The Cuckoo’s Nest and The Rocky Horror Picture Show. Not a bad path to the door of George Lucas. 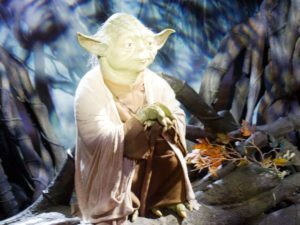 Roger Christian, Art Director on the 1977 original and Second Unit Director on Return of the Jedi remembered Fisher’s early time with Star Wars and gave a glimpse into the quieter side of her character. “I first met Carrie when I was speaking with 4th assistant director Peter Kohn on the stairs leading to George’s office in Elstree. Having just seen George, Peter stopped me on my way out to tell me a funny story and as we were laughing a vice timidly asked “are you laughing at me” I turned to see the question was serious, the young woman standing before me had a hat with flowers around the brim pulled down in an attempt to hide under and a long flowing dress that also felt like it was saying I’m not really here. “No we aren’t laughing at you, I replied, Peter here was telling me a funny story. I introduced myself and asked if I could help. She said “I’m Carrie Fisher, here to play Princess Leia.” We both said welcome to Star Wars and we will take you to George. I explained to her that Peter was there to look after the actors. 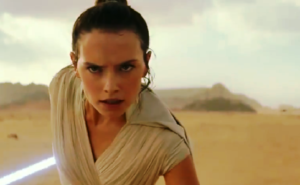 George Lucas himself was well-aware of the difficulty of finding the right actress for the role. Fragile but strong, wilful but co-operative, Leia had to be many things but above all needed to have steel within those young bones. Fisher had all of them, and the confidence that being cast gave her allowed all those traits – which she already possessed – to come to the fore. While Ford clearly had the sardonic and confident Han Solo well within his range and Hamill the wide-eyed, idealistic young farmboy comfortably within his abilities it was Fisher’s Princess Leia who required the smartest casting. 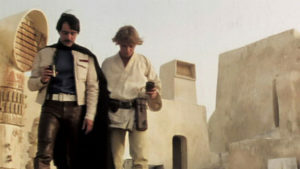 The cornerstone to practically every element of the film – after all, in A New Hope she is the only principal Rebel character who interacts with Han and Luke, all of the Rebel command structure and faces Vader and Tarkin – her casting and the way in which Fisher took that and ran with it turned a great film into a classic. As a creative force, Fisher wouldn’t flourish until much later in her career. 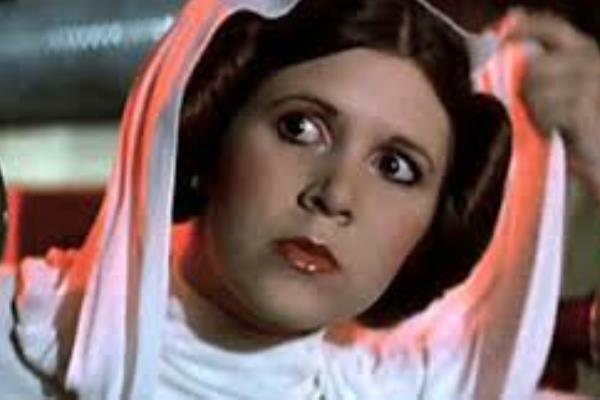 Between 1977 and 1983 she hosted an episode of Saturday Night Live, sang the Life Day Song on the infamous Star Wars Holiday Special, appeared as the Mystery Woman in The Blues Brothers with Dan Ackroyd and John Belushi in 1980 and co-starred in Under The Rainbow with Chevy Chase in 1982. On stage, she performed in 1980’s Censored Scenes From King Kong and in 1982 took the role of Sister Agnes in Agnes of God but 1987 and Postcards From The Edge would ease her into another lane altogether and see her legacy cemented as a great wit and a social observer.